At least one season in the year has to feature black and/or white and so it is again in the summer of 2013 that strong contrasting black and white is featured. Black and white is easy: easy to buy, easy to wear, easy to coordinate and match, easy to travel with and for the most part, acceptable no matter where in the world you are. As well if you have a good idea of your closet inventory, and know what you NEED, shopping will be easy. 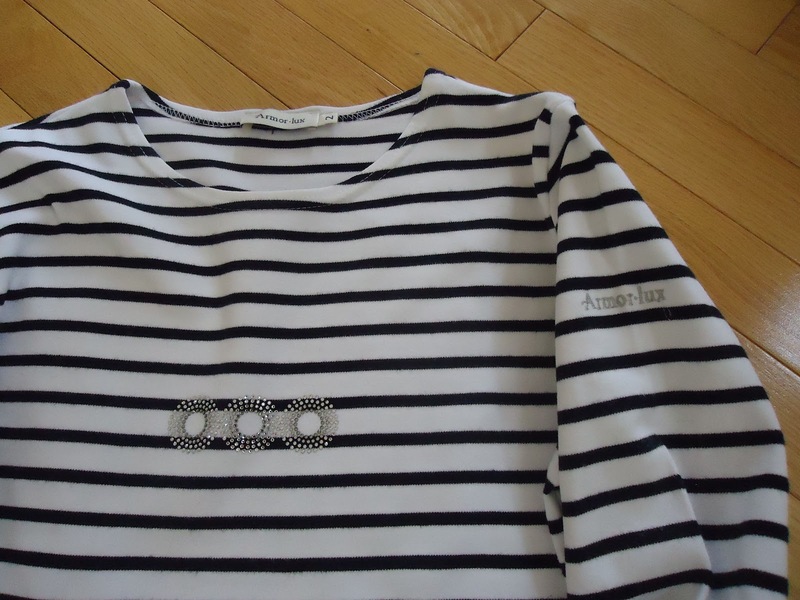 Armor Luxe black with white stripe pullover purchased in Arcachon, June, 2013. I was in Arcachon (a seaside French city) a couple of days ago with my husband and brother-in-law and for the most part I was deferring to their shopping whims, which for the most part include wine and food. However, when I eyed the shop with Armor-Lux clothing, it was I who stopped short and said, "I'll be just a minute." I knew exactly what I wanted, a black with white stripe 3/4 length sleeve crewneck. 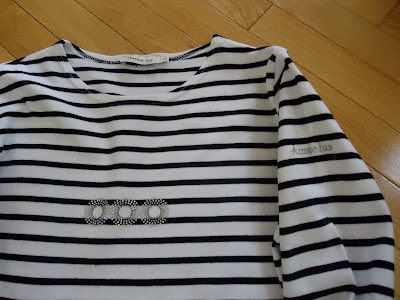 Bien sur, je trouve - I found it and within three minutes had made my purchase. I love shopping when I know exactly what I NEED. August, 2010. Photo by JoyD. This is now my third Armor Lux striped top. 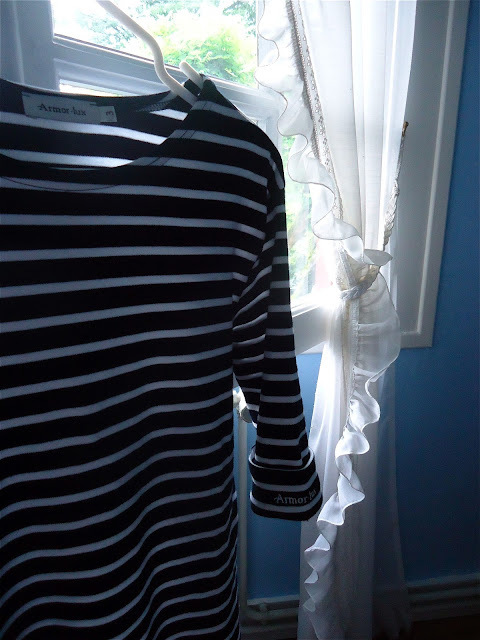 With this recent purchase, I have both a black with white stripes and a white with black stripes, and my black and white top NEED categorization has been fulfilled. The white with black stripe has long sleeves whereas the new one has 3/4 length sleeves. I am always pushing up the sleeves on this one so I am glad I found the other. For a more philosophical take on black and white stripes, I will quote Shel Silverstein's thoughts . . . I asked the zebra, "Are you black with white stripes? Or white with black stripes?" And the zebra asked me, "Are you good with bad habits? Or are you bad with good habits? Are you noisy with quiet times? Or are you quiet with noisy times? Are you happy with some sad days? Or are you sad with some happy days? Are you neat with some sloppy ways? Or are you sloppy with some neat ways?" And on and on and on and on and on and on he went. I'll never ask a zebra about stripes . . . again.